December is the month when many Canadians open up their hearts and wallets to donate to good causes. It is also the time many charities actively solicit such donations. 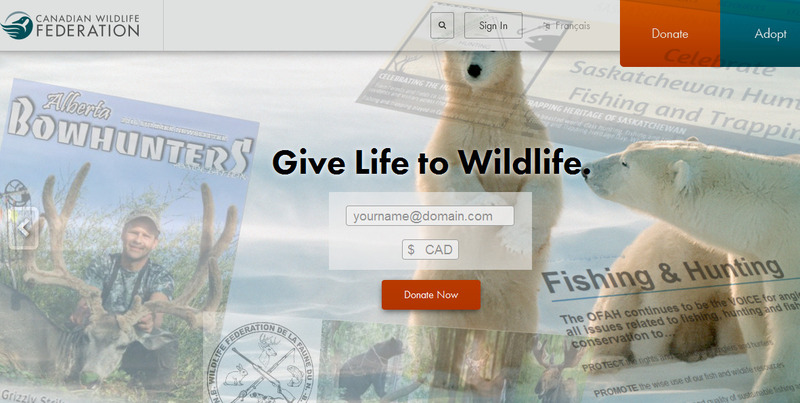 One such heavy fundraiser through the mails in December is the Canadian Wildlife Federation (CWF). According to the Canada Revenue Agency, this 54-year-old registered charity is devoted to the protection of animals. However, it would be closer to the truth to say that the CWF is devoted to protecting some but not all animals—a fact that the CWF does not reveal on its website or in its annual December fundraising mail-outs. There is much written on the CWF’s warm and fuzzy website about protecting wildlife from human activity and about endangered species and the need for biodiversity. There is nothing, however, to inform a potential donor that the Canadian Wildlife Federation is the creation of provincial hunting organizations—which it is. At its root, the conservation ethic of the CWF is more akin to resource management; as the CWF says, it “encourages the wise use of our natural resources”. “We believe in living sustainably for future generations. Canadians should be able to enjoy the outdoors for all it has to offer through gardening, hiking, fishing, canoeing, camping, bird watching, swimming, wildlife photography, and so much more”. The “and so much more” at least includes wildlife hunting and trapping because, as I say, the CWF’s founding members are almost all groups that actively promote hunting, fishing and trapping and according to a 1994 report, these founding groups hold a majority of seats on the CWF’s board. The inclusion, in a later paragraph, of the statement: “We will use the best available science-based information to develop our policies, programs and communications” is arguably a nod to the hunting community. Advocates of hunting insist that scientific evidence and not sentiment (in other words, urban bias) should guide government policies toward hunting. Therefore an opponent of the B.C. NDP’s proposed ban on the trophy hunting of grizzly bears in B.C., like Cranbrook’s Tom Shypitka, the B.C. Liberal candidate in the Kootenay-East riding in next year’s provincial election, is quoted by the Cranbrook Townsman as saying that he supports “science-based decisions when it comes to wildlife issues,” and that science says the grizzly population in B.C. (more than 15,000) is healthy and can therefore support a hunt. In the Townsman article, a spokesperson for the the B.C. Wildlife Federation—a CWF founder—explains that a ban on the trophy hunting of grizzlies is actually consistent with its policy that hunters should utilize the whole animal. A 2012 Facebook post by a group purporting to be opposed to hunting grizzly bears quotes the CWF Facebook page as stating: ” we do not support the wasteful use of wildlife”. My searches, however, do not find this statement on the CWF website, or any reference to any policy concerning either trophy hunting or trophy killing. You can also hunt in vain through the Canadian Wildlife Federation’s entire website—including its annual reports and financial statements—for the identities of the groups that make up the federation. According to a 2012 piece by the Vancouver Humane Society, which thoroughly exposes the CWF’s hunting background, “the CWF comprises twelve provincial organizations, most of which have a major focus on protecting and promoting hunting and fishing”. The Alberta fish and Game Association (AFGA), for example, lists itself as a founding CWF member and links to other CWF members. AFGA also links to the Alberta Bowhunters Association, the Alberta Professional Outfitters Society and the Alberta Trappers Association. Individually, all 10 of these organizations are upfront and honest about their focus on promoting the interests of hunting, fishing and trapping. In their collective guise as the Canadian Wildlife Federation, however, they are anything but upfront and honest. One of my morning “McDonald’s coffee friends”—a retiree named Tom—has been receiving the Canadian Wildlife Federation’s December fundraising letters for years and dutifully answering them with annual donations in the $100-plus range. Tom strongly believes in wildlife conservation—in the sense that he believes in protecting wild plant and animal species and their habitats from the effects of human activities. He had no idea that the CWF had any links to the hunting industry and he was very disappointed when I explained to him that, while the CFW was indeed committed to wildlife conservation in general, in specific instances it actively supported and promoted the killing of wildlife for both fun and profit. 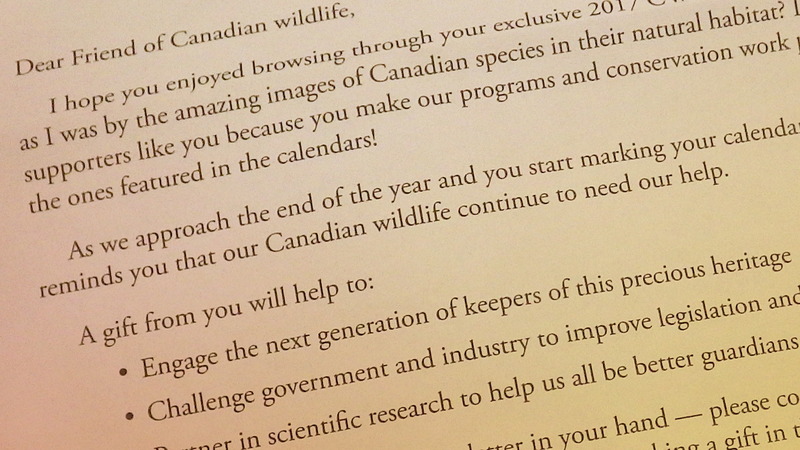 Tom showed me the fundraising letter that he received this December from Rick Bates, CEO and Executive Vice-President of the Canadian Wildlife Federation, which is addressed to “Dear friend of Canadian wildlife”. “As we approach the end of the year and you start making your calendar with your 2017 activities, I hope it reminds you that our Canadian wildlife continue to need our help. Right now–while you have my letter in your hand–please consider making a gift! Maybe there is someone special that you would like to honour by making a gift in their name? Tom tells me that he has yet to unwrap the 2017 CWF calendar that he received with an earlier CWF mailing and that he will be returning it unopened. Tom specifically opposes sport hunting altogether and he feels that the Canadian Wildlife Federation has misled him by not being utterly transparent about its deep connections to and origins within the hunting industry. Ultimately, it’s not about the ethics of any kind of hunting at all; it’s about the ethics of not telling the whole truth. It’s about the Canadian Wildlife Federation willfully hiding the fact from potential donors that the groups that founded it and run it are the hunters of the very wildlife that the federation says that it is working to protect from dangerous human activities. Dangerous human activities, which people like Tom naturally assumed included hunting. Click the images to enlarge them. Recently, people have killed protected animals in Yellowstone arbitrarily. If people become angry, people ignore the law or morality… My strongest opinion is that if decision makers were concerned about the Earth, they would build an ark…which they have not…Party hard, love life! Very impressed with your writing, very good and take good care of yourself. Retired and enjoy the internet connection.